LEFT: Martin Luther lived here from 1498 to 1501. 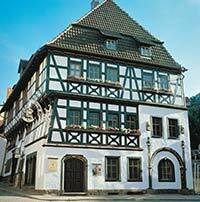 The half-timbered house is now a museum. Martin Luther's 300-day sojourn in Wartburg Castle gets more press, but long before he escaped to his hilltop refuge at the beginning of the Reformation, Luther spent three years in Eisenach as a teenager. He came to the town in 1498, at the age of 15, to study Latin; during that time, he boarded with the family of Alderman Cotta. In 1898, the Lutherkeller restaurant opened in the Cotta house, and tourists could see two "Luther Rooms" (where the young Latin scholar lived) upstairs. The restaurant is still in business, but the Luther Rooms were expanded into a full-fledged museum in 1956, with exhibits that range from costumed mannequins to paintings and interactive video screens. In size and scope, the Lutherhaus Eisenach is no match for Wartburg Castle or the nearby Bachhaus Eisenach, but it's a pleasant small museum that costs only a few euros to visit. If you have even a slight interest in Martin Luther and the Protestant Reformation, we recommend that you allow 45 minutes or an hour for a visit to the Luther House. And if you're a Lutheran pilgrim, the museum and its "Luther Rooms" shouldn't be missed during your tour of Luther cities. Photo: Thüringer Tourismus GmbH / Barbara Neumann.